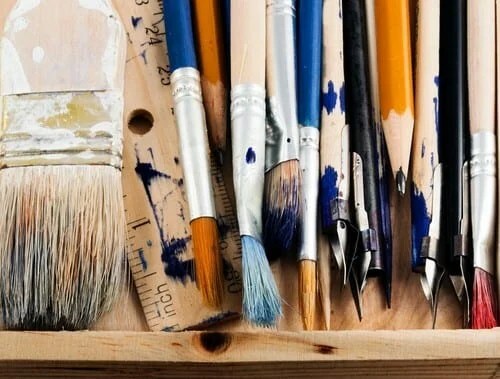 Set of art tools on a white background. It has never been a better time to be a crafty or creative person looking to sell artwork or vintage items online. Numerous sites enable you to create a revenue stream from home. And, while you have the luxury of being your own boss, it is hard work to make it work. Thankfully, most sites aim to make you successful — after all, they only get paid when you sell something. No matter the methods you choose to sell your items, social media is a great way to showcase what you have to offer. Create a Pinterest board that links back to where you sell your items and post information about new goods on Twitter and Facebook. Or, if you work in a visual medium, post pictures of your products on Instagram. Currently, this service is by invitation only. Amazon offers invitations to applicants who meet their strict standards for selling handmade goods on their site. The application is rather detailed, but the opportunity to get in on the ground floor of this global service makes filling out the app worth the time. This service has a 12 per cent fee associated with each sale. This 10-year-old company is by far the best-known site for handmade and vintage items. Selling on the platform is simple, but it requires more marketing outreach and branding than most sites. Etsy’s Seller Handbook details the steps “store owners” need to take to be successful. Sellers have the option to use several currencies and languages on the site, too. This site, which is operated in association with National Geographic, specialises in selling work from artisans and art collectives who don’t typically have access to a widespread audience. Think undeveloped countries and underrepresented populations. First Nations and rural artists who craft traditional products should strongly consider this site. A great site to sell visual art, Society6 is extremely simple to use. You only need to upload images and let Society6 do the rest. Shoppers can purchase your art in various forms, which is then printed and shipped by Society6. The best part: you get the money and maintain full control of the rights to your work. This Toronto-based company sells products from around the world. All goods on iCraft are handmade, which means that vintage goods are not permitted. There is a 25 USD registration fee, which is about 33.41 CAD, and packages can be purchased for as little as 5 USD, or around 6.68 CAD. To establish a commerce website, you may need to put in a little more upfront work and money, and you need to find creative ways to direct traffic to your site (hello, social media). However, a personal website is typically cheaper because you can avoid the fees associated with other commerce sites. There are many sites available for you to sell your arts, crafts and vintage goods. Before choosing where to place your products, integrate a free accounting software like Sage One for hassle-free accounting, invoicing and financial reports. This way you don’t have to waste your time and energy keeping your books in order because it does it all for you. That means you can concentrate on what is important: you arts and crafts. I have a shop on Etsy and have used it to find new homes for childhood treasures and other vintage / handmade items, while making a bit of extra spending money, too. You do have to treat it like a real professional business, since your reputation is important, but it’s not hard to learn the ropes. Sounds interesting, though I don’t have anything left now but when I left Germany it would have come in handy since I had to sell/auction off/give away/or throw away so much. This is a very interesting post,thanks for sharing these tips. This is interesting, when I move closer to my daughter she wants to try things like this. Sounds interesting,thanks for the tips ! Tis is a wealth of information to find sites like this for crafts.Thanks for all the great tips. Thanks for the tips, some great things to keep in mind as I move forward with my business, thanks! I have not tried selling from home. I have used some of these sites though to buy items. I think it is great when we can support people working from home like this. Wow! I’ve always heard of Etsy, Pinterest, and Amazon, but I had never discovered Society6 or Novica! I never knew there were so many online possibilities of selling one’s arts and crafts; it’s a delightful find that I will keep in mind. To me, it’s a nicer idea than doing vendor selling continuously.